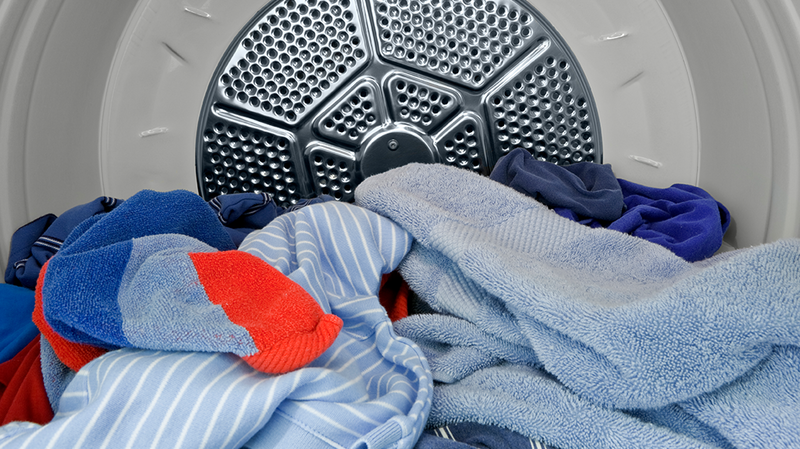 Save money with this tip about proper dryer use. When you want to save time and money the place to start is with your dryer. First and foremost do not overload the dryer. For most home-style washers, a whole washer load will not fit into the matching dryer. Dryers were meant to tumble dry the laundry, hence the name tumbler dryer. Air is what really dries your laundry, the heat really just speeds up the process. When you overload the dryer, the air cannot circulate through the load. So the outside of the ball gets hot and dry while the inside stays wet. This creates the perfect environment for fires, burnt linen, and extremely wrinkled laundry. The more airspace you allow around your clothes the faster and better they will dry, time will be saved, and your electric bill will be lower. Remember that two properly sized loads are always better than one oversized load. and a properly loaded dryer will allow you to see the back of the dryer when the clothes are wet.